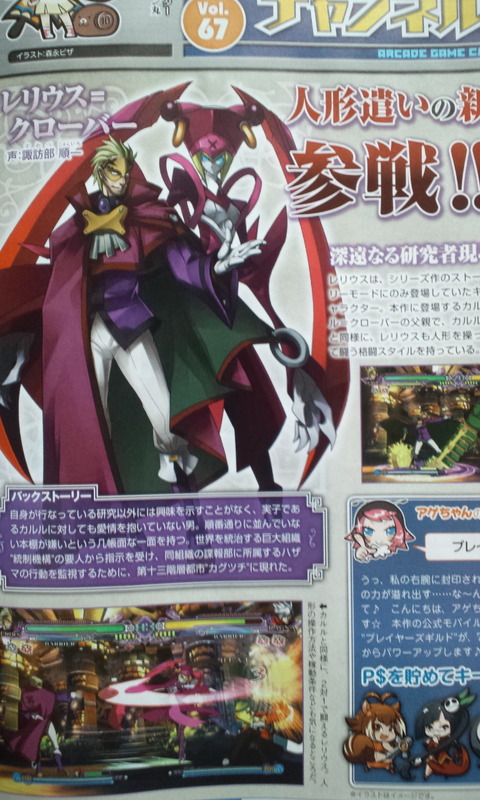 Relius Clover is the latest addition to Blazblue Continuum Shift II’s playable roster. A new arcade update will be coming this winter that will have him join the fighters, as well as add further balance changes to the game. Relius will be using a doll to do his dirty work for him, just like his son, but it hasn’t be revealed just how closely his gameplay may or may not be compared to Carl’s. I’ve been hoping for Relius to join the cast for sometime now, however nothing has been mentioned about whether he will be arriving on console versions of the game yet. I don’t see Arc System Works not bringing him over though, as the other added characters have all become available through DLC. Then again, with the way fighting games have been handled as of recent times, I don’t know what to think anymore. This entry was posted in Gaming News and tagged Arksys, Blazblue Continnum Shift II, I'll never...forgive you!, Relius Clover on July 27, 2011 by Prota.